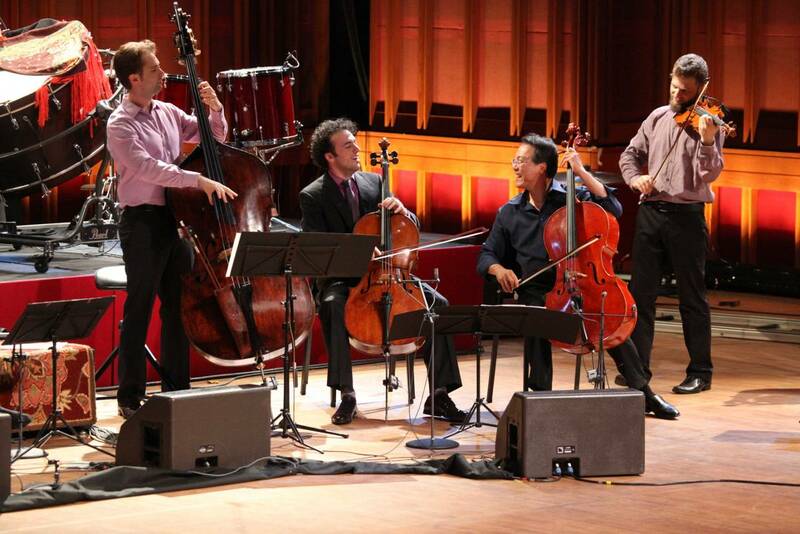 Yo-Yo Ma with musicians from the Silk Road Ensemble, Ozawa Hall, Tanglewood. ; photo: Hilary Scott. Yo Yo Ma and the Silk Road Ensemble got the BSO’s 75th anniversary season at Tanglewood off to a rousing start with a pair of concerts in Ozawa Hall June 22 and 24. Whatever Maestro Koussevitsky had in mind when he established the orchestra’s retreat and training center in the Berkshires, not even a visionary of his stature would have forseen a concert opening with a green haired gaita player wending her way through the audience. As the musicians assembled on stage and settled into an improvisation called Wandering Winds, Christina Pato, a raven-haired Spaniard (streaked with Kelly green), strolled through the audience on the lawn playing the gaita, the bagpipe of the Galician people of Spain. She is the second Galician bagpiper I’ve seen in concert, after Carlos Nunez, who toured with the Chieftains years ago. He drew references to Jimi Hendrix for the novelty his style and flair bore in comparison to highland pipers. Although fresh and original to all appearances, Ms. Pato is anything but a novelty act. She has a Doctorate from Rutgers and briefcase full of other academic credentials, leads her own touring band, and is a member of the Silk Road leadership council. The prominence of her role in this report is a function of my predilections; the show was so varied and full of treats that one couldv’ve focused on a dozen other elements. Such as the finale, Turceasca, from the Romanian gypsy tradition. It allowed all 17 musicians to seem to solo simultaenously, until a duet/duel developed between Wu Tong and (oops!) Ms. Pato. Wu Tong plays the Chinese sheng with the verve and personality one remembers from Dizzy Gillespie. Besides the role of host/MC, Yo Yo Ma was largely an ensemble player, except on Qasida, premiered on the 22nd. A Silk Road commission by Dmitri Yanov-Yanovsky, from Uzbekistan, it was written for MA to play with Kayhan Kalhor on the ancient Persian kamancheh. There were 20-30 minutes of encores, which resulted in as upbeat and cheerful an exiting audience as I’ve ever seen. They are sure to regale their friends about this event, a concert by the Silk Road Ensemble, at Ozawa Hall where Yo Yo Ma founded it in 2000. Depending on their predilections, they may focus their reports on the pipa, or the tablas, or the jang-go.